This article is about the video game. For the series, see Gradius. Gradius (グラディウス, Guradiusu) is a 1985 horizontally scrolling shoot 'em up video game developed and published by Konami, originally released as a coin-operated arcade game in 1985. It was the first game in the Gradius series. In Gradius, the player maneuvers a spacecraft known as the Vic Viper that must defend itself from the various alien enemies. The game uses a power-up system called the "power meter", based upon collecting capsules to 'purchase' additional weapons. The arcade version of Gradius was released internationally outside Japan under the title of Nemesis, although later releases kept the original title. Home versions were released for various platforms, such as the Famicom/NES, the MSX home computer, and the PC Engine, among other formats. 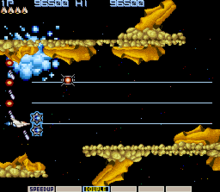 In Gradius, the player takes control of the Vic Viper, a trans-dimensional spaceship, and must defend it against waves of enemies. Here, the player battles their way through stage three. The player controls the trans-dimensional spaceship Vic Viper, and must battle waves of enemies through various environments. The game became synonymous with the phrase, "Destroy the core! ", as the standard of boss battles in the Gradius series involved combat with a giant craft, in the center of which would be situated one to several blue colored spheres. These bosses would be designed in such a way that there would be a straight passage from the exterior of the giant craft which leads directly to one of these cores. The player must fire shots into this passage while avoiding attack patterns from weapon emplacements on the body of the boss. However, small but destructible walls are situated in this passage, impeding the bullet shots from damaging the core, and must be whittled away by repeated well-placed shots. In a way, these tiny walls represent the boss' shielding gauge until its core is finally vulnerable to attack. Some bosses have the ability to regenerate these walls. When the core has sustained enough hits, it usually changes color from blue to red, indicating that it is in critical condition and its destruction is imminent. Upon the destruction of a core, a piece of the boss may be put out of commission, seeing that it is no longer powered by a core, or if all of the cores are destroyed, the entire boss is defeated and explodes satisfyingly. Note that these cores are not present on the more organic bosses of Gradius. Such bosses have weak spots in places such as a mouth, head or eye. When gameplay begins, the Vic Viper is relatively slow and has only a weak gun. This level of capability is generally insufficient for engaging enemies, but the Vic Viper can gain greater capabilities by collecting and using power-up items. While most arcade games utilize distinct power up-items that each correspond to a specific effect on the player character, Gradius has a single power-up item. The effect of this power-up item is to advance the currently selected item in a power-up menu that appears at the bottom of the screen. When the desired power-up is highlighted, the player can obtain it by pressing the power-up button, returning the menu to its initial state in which no power-up is highlighted. 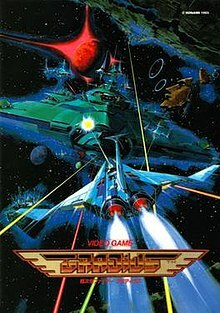 Gradius began development when series creator Hiroyasu Machiguchi was given a team to work with and asked everyone what kind of game they wanted to develop, to which they responded being a shoot 'em up, with the intent of surpassing Namco's Xevious. They decided to make it a horizontal shooting game because they wanted to reuse material from Scramble as much as possible, and Gradius was originally named Scramble 2. The development lasted for a year after refining and experimenting with the gameplay. The team originally tried twenty different movement patterns for the Options and used a process of elimination when something did not work. For the story, Hiroyasu's team was inspired by science fiction movies, with the popular sci-fi films at the time being Star Wars and the anime adaptations of Lensman. The team saw Lensman together and it influenced the game's story. Its plasma laser also left a big impression on them and was why Gradius featured a Laser weapon. The Moai were included because they wanted to add a mysterious element to the game like Xevious and its Nazca Lines. Ports of Gradius were also done for the Amstrad CPC, Commodore 64, Microsoft Windows, MSX, NEC PC-8801, Famicom/NES, PC Engine, Virtual Console, Sharp X1, Sharp X68000, Mobile phones, Sega Saturn, PlayStation and Sinclair ZX Spectrum. The NES version of Gradius introduced a cheat code that would later become known as the Konami Code, as it would be used in numerous future Konami games. In this game, inputting the code while pausing the game would grant the player's ship multiple power-ups instantly. The NES port of Gradius was also converted for the Nintendo Vs. Series arcade platform. It lacks no cheat codes, but allows the player to continue indefinitely. The arcade version of Gradius is included in the Gradius Collection for the PlayStation Portable and in Konami Classics Series: Arcade Hits for the Nintendo DS. A version for the Game Boy was also released in 1990 under the European name Nemesis. It is the first portable game in the Gradius series and contains five levels which play similarly to previous Gradius games. Players select the stage and the number of available extra lives at the start. The game was later included in the compilation Konami GB Collection Vol. 1, where it is titled Gradius. Alfa Records released a limited-edition soundtrack album for this game (Konami Game Music Vol.1 – 28XA-85) on 27 June 1986. Apollon Music released a limited-edition soundtrack album for this game (Original Sound of Gradius – KHY1016) on 5 May 1987. In addition, disc 1 of Konami Music Masterpiece Collection, which was released on October 1, 2004, is mostly devoted to Gradius. The game went to number 2 in the UK sales charts, behind Feud. The Western cover art for the NES version claimed that it had sold one million copies in Japan. GameSpot stated that Gradius was one of the toughest side-scrolling shooter games available on the NES, second only to Contra. IGN has given the game a rating 7 out of 10 for its re-release on the Wii Virtual Console and has hailed it as one of the greatest classic side-scrolling shooter games. Gradius spawned several sequels, the first of which was 1986's Salamander. The series has continued into the seventh generation with Gradius ReBirth. It was also re-released on Windows Store on December 20, 2013, GameNow in May 2014 and for PlayStation 4's Arcade Archives on January 25 in Japan. An NES port was re-released for the Nintendo Switch Online on September 19, 2018 in Worldwide and Update release as Gradius: Stage 5 Stronger Version (グラディウス ステージ5最強バージョン, Guradiusu Sutēji 5 Saikyō Bājon) on November 14, 2018 in Worldwide. ^ "Arcade Action". Computer + Video Games. October 1985. ^ "Year in Review". Cashbox. January 17, 1987. ^ "Konami Classics Series: Arcade Hits". Konami. Archived from the original on 2007-08-23. Retrieved 2007-04-11. ^ Weiss, Brett Alan. "Gradius (NES) - Review". AllGame. Archived from the original on 2014-12-10. Retrieved 2017-07-06. ^ "World of Spectrum" (JPG). Worldofspectrum.rog. Retrieved 2016-08-17. ^ "Sinclair ZX Spectrum Reviews". zxspectrumreviews.co.uk. Archived from the original on 2016-03-04. Retrieved 2015-09-04. ^ "World of Spectrum". Worldofspectrum.rog. Archived from the original (JPG) on 2016-03-05. Retrieved 2018-01-14. ^ "Nemesis". ysrnry.co.uk. Archived from the original on 2016-03-05. Retrieved 2015-09-04. ^ "Gradius Cover Art". MobyGames. Retrieved 2014-08-02. ^ Ryan Davis. "Gradius Review". GameSpot. CBS Interactive. Retrieved 2018-01-14. ^ Lucas M. Thomas (2007-01-09). "Gradius VC Review". IGN. News Corporation. Retrieved 2018-01-14. This page was last edited on 21 April 2019, at 16:25 (UTC).